La France est merveilleuse. I'm not sure I need to say anything more but of course I will. Spending the weekend in Strasbourg was like being placed ever so gently inside a picture postcard....what an absolutely lovely little storybook town. The entire historic city center is a World Heritage Site. And the tree in the town center? A huge mass of blue and white lights...not too many and not too few...just right don't you think? And the little wooden village that sits at the base of the tree? So sweet! miniature houses that hide a candle inside, fabulous scarves and jewelry and chocolates and gingerbread. Oh and did I mention the Alsatian pottery? We arrived in Strasbourg on Friday afternoon by train from London with an all too brief stop in Paris. We all agreed that it might actually be a crime to travel thru Paris without enough time to stop for a peek or at least to sit for a while at an outdoor cafe. This is the train station Gare du Nord and yes of course that is an amazing little chocolate shop sitting right there in the station. It sits very nearby to the amazing little sandwich shop. (See paragraph 1 regarding the French). I cannot talk about France without at least eight hundred references to food and someone please please tell me how these French women stay so thin because the bread y'all...I actually have no words. (And of course in my case that is just an expression). We ate in the cutest little bistro on Friday evening and their specialty? Why bread and cheese naturellement...I had brie drizzled with warm honey then melted over thick bread and topped with walnuts. Isn't that what you make for dinner most nights? Saturday we spent the entire day in the markets and also walking thru the magnificent cathedral. The stork is the symbol of Strasbourg and it is everywhere, including carved into the sandstone atop the massive Gothic Cathedral Notre-Dame. We stopped for lunch at a creperie that sat just outside the cathedral. We shared a savory and a sweet...the banana nutella crepe was tres bon! Saturday evening we dined on fondue in a restaurant which is known for having the biggest cheese board in the world. I haven't even begun to talk about my whirlwind two days in England but this post is getting (has gotten?) l-o-n-g so I'll save that for another day. Sorry and you're welcome. The city of Strasbourg is beautiful. This post seals it. We are officially kindred spirits. Looks amazing there, the decorations are gorgeous! So glad you are having a wonderful time. This is like a dream come true! What I would give to make such a trip with good friends! I´m glad you got to have such a great experience! It all looks so Christmassy and beautiful! Can´t wait to see more on England! Looks like so much fun. I love the pottery! What a great way to jump start your Holiday. 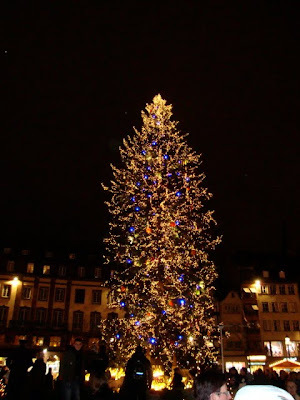 I need to go Christmas ornament shopping in Strasbourg. Target has nothing on that! So beautiful! Looks like you are having a marvelous time. This was a girl trip!?! Oh man, now I'm really jealous! ALL of the pictures are beautiful Joyce...especially loved the pottery! I could get in lots of trouble there! What an awesome trip you had!!! And the food sounds amazing too. You are such a great writer. I actually felt like I was right there with you. Brings back memories of my time spent in Europe many years ago. I want to go back! Love & blessings from NC! I would love to go to Europe! Your pictures are amazing! Thank you for sharing them! What a perfectly wonderful trip at a perfectly wonderful time of year. 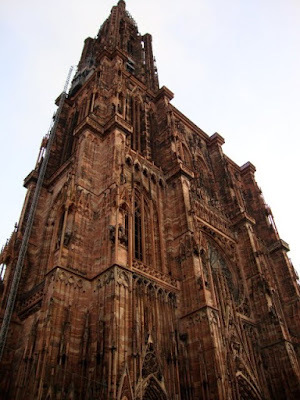 We spent a day in Strasbourg when we took a Rhine River cruise a couple of years ago. Stopped in a cheese shop that is suppose to sell more cheeses than any in all of France. The woman at the counter didn't speak any English, so my friend Susie and I just pointed to one. Then we went next door and bought a couple of bottles of wine and eight of us sat at a table on the sidewalk drinking wine and eating cheese. I too wonder about the secret of French women. When we went to Paris and the French Mediterranean in the spring, we ate three course meals with dessert every night, and I didn't gain a single pound. Must be something about all of the fresh ingredients in the food. How wonderful to see everything so decorated for the Christmas season. My favorite was the village of houses underneath the tree! I loved reading all about the first part of your trip. Oh, I know you and your friends had a wonderful time filled with fun memories to treasure forever. What an absolutely grand experience, Joyce. It's 9 a.m. here and after that post, I'm running to my kitchen to get something to eat. Mind you, it will not be crepes, macaroons, or cheese from a giant cheese board, but it will be food, glorious food. Oh, and a great cup of coffee. I loved this post. I felt like I was there with you lovely ladies.